Rumors say that the Miami Dolphins are showing high interest in Mike Wallace and are looking to add him to the team to give second year quarterback, Ryan Tannehill, a deep threat option. 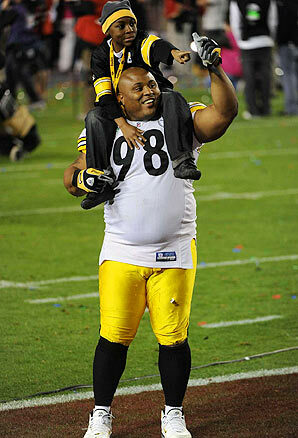 I believe the Steelers have made their piece with losing Wallace, but how will they replace him? They will most likely look for a receiver or two in the NFL Draft. Foote has been a solid role player for the Pittsburgh Steelers for a decade. If you remember, Foote left the Steelers in 2009 to play for his hometown, the Detroit Lions. After that season was over, Foote had no desire to continue his career in Detroit. He missed his place on the Steelers roster. Reports have been released that the Steelers and Foote have been talking on a new deal. Foote is now heading into his twelfth season in the league, however, he is coming off one of his best seasons as a pro. How long can he keep it up if he stays with the black and gold? Lewis, who ironically was friends with Mike Wallace growing up, is also going to be a free agent. When the season ended, reports said that Lewis should be Steelers’ first priority of the offseason. However, even with the Steelers getting under the salary cap by restructuing a number of players’ contracts, the Steelers did not re-sign Lewis. Now after signing cornerback William Gay after being released by the Cardinals after one season, Lewis may not be as a high priority as expected. It looks that they will let Lewis test the market before giving him an offer as the Steelers do often. Think back to 2010 when the Steelers let safety Ryan Clark test the market before resigning him as a Steeler. Lewis had a very productive 2012 season. However, with Gay back, they may just look for another corner in the draft to make up for the talent. Lastly, will the Steelers bring back Mendenhall? The five year pro has had an up and down career as far as productivity. He has only had two, one thousand yard rushing seasons in the league. Injuries do have a big role in this, but fumbles do as well. Mendenhall fumbled the ball three times on only fifty-one carries last season. He may be on the boarder of a bust in a lot of people’s eyes. He also may be the blame of the Steelers’ lack of a rushing attack over the past couple years. It does not seem that the Steelers will be bringing him back, but how will they answer these problems? In Addition, running back Chris Rainey was released from the Steelers the day he allegedly assaulted his girlfriend. The Steelers will need to re-build this running attack to take pressure off of quarterback Ben Roethlisberger. March 12th kicks off the start of free agency around the NFL. It will be interesting to see how many players the Steelers will get back for the future. Will the Steelers get a big free agent this year? Knowing the Steelers organization don’t expect it. They love building through the draft. However, they have found some gems in free agency in the past. For example: James Farrior, Ryan Clark, Mewelde Moore, Charlie Batch, and Shaun Suisham. We are getting closer to seeing our 2013 Pittsburgh Steelers. 13 Comments on "Steelers Free Agency 2013: Who Will Stay And Who Will Go"
A couple observations : First , the Steelers need to continue the youth movement . Bottom line , they need to get younger . Guys like Casey Hampton need to go bye bye . A great player for alot of years but the time to move on has came . Second , they finally found an up and coming cornerback in Keenan Lewis . They need to resign him . As far as losing Mike Wallace , I say good riddance to bad rubbish . The guy was was a one trick pony that was more concerned about his paycheck than winning football games . This is clearly a year of transition for Pittsburgh, and we’ve discussed most of these situations here before. I’m surprised the article didn’t mention the situation at backup QB. Given the Steelers many needs, the team may have to retain one of their aging veterans (Batch or Leftwich) rather than bear the cost of replacing both. Likewise, Polamalu, Foote, and K. Lewis will probably be back because needs elsewhere are so great. We cannot afford to replace all of our aging veterans and probably can’t find equivalent talent for all of them, anyway. Although we re-signed Wm. Gay and will probably retain Lewis, neither is a top tier CB, and that position will remain a priority in the draft, along with the defensive line. We emphasized offense in the last two drafts; it’s time to give LeBeau the talent he needs. Our defensive statistics are misleading because the stats focus on yardage. Against the run and the pass the Steelers’ D is average in short yardage and red zone situations. Our mediocrity also shows up in our lack of turnovers and sacks against better teams and ultimately in our record. The D must be rebuilt to suit the pass-happy NFL rules, or we will face another 8-8 season in 2013. Thanks for the comments guys! There will be more articles to come by me on Steelers Gab. If you have Twitter, follow me @ProFballHotline! We resigned William Gay???? Unbelivable! I stand by my end of season comments that Tomlin should be shown the door. Looks like more of the same going forward to me at this point. I couldn’t agree more and to doctor George, although I agree we need to keep the defense in mind with the draft ( edge rusher more important than corner or d line… We invested enough high round picks the past couple of years in d line and corner)…WE NEED A RED ZONE WEAPON. I don’t care how we get one, first through seventh round but we need a 6’3″ or bigger mobile ATHLETE! Yea I can see that. I’ve tried posting long write ups on here a bunch of times that wouldn’t appear. Has that ever happened to anyone else? Hey guys, I just made a Facebook page for all of you to go and talk to me! Like the page because there will be more Steelers articles shortly! All you need to do is click my name on THIS comment, and it will take you right to the page! Rock out STEELER NATION!